A number of Bristol Parks Forum members do not currently have a clear visual identity, or a means of promoting their activities and the parks they volunteer to look after, to the public. Many do not have websites or an online presence, or need the ones they do have improved & do not have the skills themselves to do this. 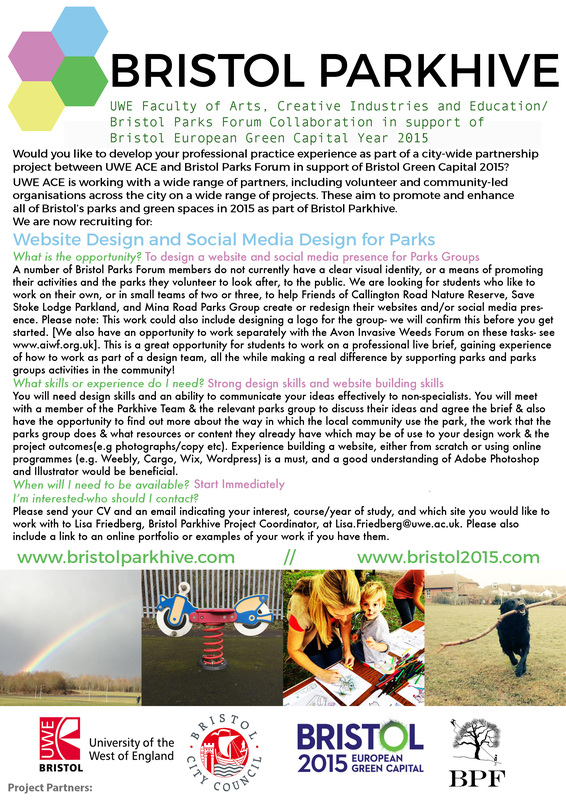 If you would like to get involved in a self-contained project as part of Bristol Green Capital- this could be for you! We are looking for students who like to work on their own, or in small teams of two or three, to help Friends of Callington Road Nature Reserve, Save Stoke Lodge Parkland, and Mina Road Parks Group create or redesign their websites and/or social media presence. Please note: This work could also include designing a logo for the group, or you could work separately with the Parks group on a project to design a logo- we will confirm this with you (and them) before you get started. We also have an opportunity to work separately with the Avon Invasive Weeds Forum (www.aiwf.org.uk) to update/refresh the existing website for the project & create new marketing and recruitment materials to encourage volunteers to take part. The Avon Invasive Weeds Project has been working in the Bristol area since 2008 and would value some support from a student designer who can help them to increase their visibility & reach through improving their website presence and design. -See here for more information. You will meet with members of the Parkhive Team & the relevant park/project representatives to discuss their ideas and agree on the brief. You will also have the opportunity to find out more about the way in which the local community use the park, the work that Parks Group does and what resources or content they already have which may be of use to you (e.g photographs/copy etc.) - to inform your design work & the project outcomes. Skills & Attributes required: You will need design skills and be able to communicate your ideas effectively to non-specialists. You will meet with the parks group to consider what they would like to develop or change about their current online identity, and then begin to design web-based solutions based upon their thoughts and needs. Skills required include knowledge of building a website, either from scratch or using online programmes, such as Wordpress, Wix, Cargo, or Weebly, and a good understanding of how to use Adobe Photoshop (possibly also InDesign and Illustrator). This is a great opportunity for students to work on a professional live brief, gaining experience of how to work as part of a design team, all the while making a real difference by supporting parks and parks groups activities in the community! Please send an email indicating your interest, course/year of study, and which location you would like to work with to Lisa Friedberg, Bristol Parkhive Project Coordinator, at Lisa.Friedberg@uwe.ac.uk. Please also include a link to an online portfolio or examples of your work if you have them.